Workwell team members are this company’s most important asset. We use the 3 R’s for positive performance assessment: Reinforcement, Recognition, & Reward. Workers feel good about themselves and have a sense of satisfaction for being part of a “winning team.” Our current “years of experience” average is 12 years. Our team allows us flexibility and expertise to deliver our commitment to excellence. 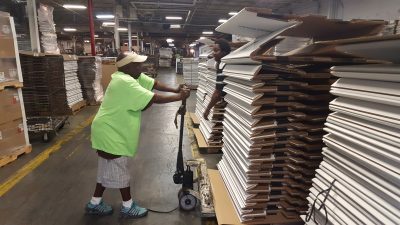 At Workwell Industries, we are committed to creating jobs for people with disabilities and others who experience barriers to employment. With over a dozen different benefit programs, many team members are fully paid by the company. Only our turnover comes from seasonal temporary workers. Our objective is to continue our healthy growth and maintain the best employer/employee relationship in the area. Every team member, whether they have disabilities or not, are ready to use all available resources to do what has to be done in order for our goals to be met. This unique blend of individuals is powered by their passion and tireless efforts to complete our social and economic goals. Sign up for our newsletter and get updates on new upgrades and improvements around the Workwell facilities, industry news and insights, and a download a free eBook all about the new Workwell Industries! 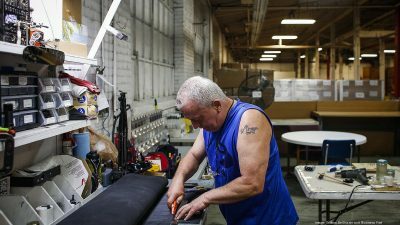 Workwell Industries is a non-profit organization committed to creating jobs for people with disabilities or who experience barriers to employment.